The Reims F.406 is a twin-turboprop light utility and commuter aircraft for up to 2 crew and 12 passengers. The Reims F.406 was originally manufactured and designed as Reims Cessna F.406 Caravan II by Reims Aviation S.A. in cooperation with Cessna Aircraft Company. On 16 February 1960, Cessna Aircraft had acquired a 49% shareholding in la Société des Avions Max Holste, which was entitled the Société Nouvelle des Avions Max Holste. In 1962, the company name was changed into Reims Aviation S.A. In 1989, Reims Aviation bought back all the shares held by Cessna and became a private French aircraft manufacturer. Nowadays, the company is nowadays known as Reims Aviation Industries and is a wholly-owned subsidiary of GECI Aviation. The Reims Cessna F.406 Caravan II is in fact a development of the Cessna 404 Titan. It uses essentially the same fuselage as the Cessna 404 Titan; components of the Cessna 425 and the wings of the Cessna 441 Conquest. The prototype F-WZLT flew first on 22 September 1983. DCAG certification was received on 21 December 1984. Every Reims F.406 aircraft tends to be individually configured with customer-specified equipment and, while Reims have used various marketing names for variants (e.g. Vigilant; Surmar - for maritiem surveillance - and Polmar - for anti-pollution patrol - ), they never appear as the official name for individual aircraft. In October 2000, Reims Aviation announced the F406 NG (New Generation) or F.406 Mark II turboprop twin, which has upgraded avionics, increased endurance and better hot-and-high performance than its predecessor, the Mark I, the original Reims Cessna F.406 Caravan II or Reims F.406. The Mark II retains the same fuselage as the original F.406, but while the former uses two 500-shp Pratt & Whitney Canada PT6A-112 engines, the new-generation F.406 is powered by two 635-shp Pratt & Whitney Canada PT6A-135As. The new version has four propeller blades, one more than its predecessor, which has two McCauley three-bladed propellers. Early 2011, GECI subsidiary Reims Aviation was assembling the 100th F.406 twin turboprop at Aérodrome Reims-Prunay. Reims Aviation plans to increase F.406 production from two aircraft in 2010 to six in 2011, ten in 2012, twelve in 2013 and fourteen in 2014. 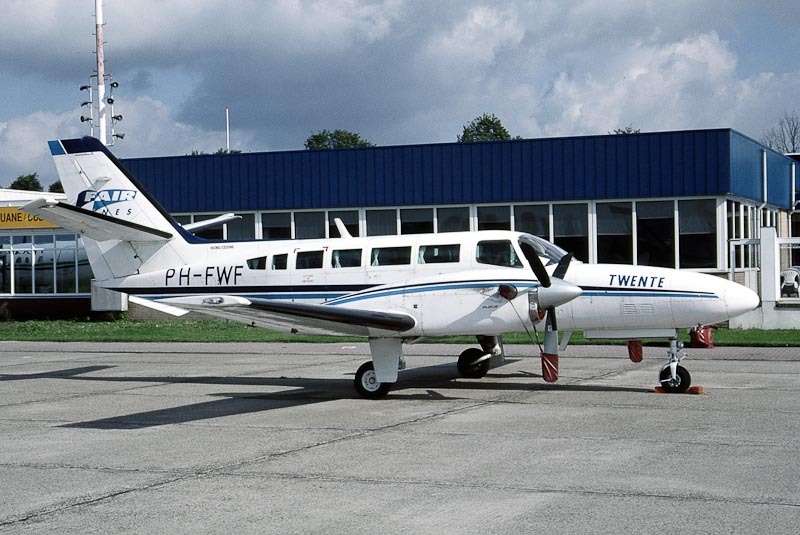 On 26 February 1988, the 1987-built Reims Cessna F.406 Caravan II c/n F406-0020 was registered PH-FWF with Aviation Service Holland BV as holder. The Caravan IIs registered with Aviation Service Holland BV were leased via Aviation Lease Holland BV to different lessors. The PH-FWF was leased to Freeway and entered service with F'Airlines in January 1995 as 'Twente'. On 3 June 1996, Duijvensteijn Aviation BV, Lelystad, was registered as holder/owner of the PH-FWF and in Ireland registration EI-CND was reserved but was not taken up. On 17 October 1996, registration PH-FWF was cancelled and the same day, the Caravan II was registered G-TURF in the UK with Air Alba Ltd., Inverness. On 27 April 1998, the G-TURF was registered with RVL Aviation, Coventry, and modified into a reconnaissance aircraft, fitted with Sideways Looking Airborne Radar (SLAR), Ultra Violet (UV), InfraRed (IR) and visual sensors. The registered owner name changed to Reconnaissance Ventures Ltd., Conventry, on 11 May 2007. As before with RVL Aviation, the aircraft is operated under contract for locating and reporting maritime pollution. Reims F.406 G-TURF uses callsign 'Coastguard 406' when on duty for the UK MCA Coastguard Pollution Control.